Last week-end we got our tomatoes planted. It has been so cool and damp in Seattle that it does not make sense to put them in unless you use some type of protection for them. We use two types of water cages to get them started. The soft red cages are filled with water and the day time air warms the water and insulates the plants at night. 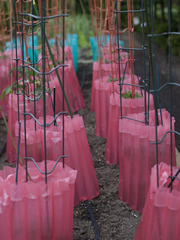 The white plastic cone shape cage is also filled with water forming an insulation to keep the small plants warm during the night. My husband is in charge of planting the tomatoes and securing the soft red cages using 3 to 4 simple bamboo stakes to help hold each cage upright. The trick is when it is time to remove the cages, it is really a 2 man job so that you do not break the plants that have now grown, often above the top of the cages. This year we planted 38 tomatoes, 17 are tomatoes that I will use to make sauce or use in cooking. Varities for cooking Viva Italia, San Marzano roma and one labled just Roma. These tomatoes are also great for roasting until brown and soft but still juicy. They hold their shape beautifully. The other tomatoes were a mix of good firm salad tomatoes like Early girl, beefsteak, flat on the top and bottom and Bush champion. There are many new varities of Heirloom tomatoes most of which are open-pollinated, unlike the hybrids, which have to be artificially cross pollinated. We went to several differnt places to find our mix of hybrids and heirloom plants. Some of the best for us last year were the Brandywine, Green Zebra, Black Russian, Hugh’s( a beautiful yellow) and a German Stripe, just to name a few. Tthere are hundreds of varities to choose from and each area has different types. Experiment, keep a log so next year you can choose the ones that work best in your garden. Of course we have an assortment of cherry tomatoes in all colors of red, orange and yellow. Plus the shape of each little jewel makes the presentation better, they are sweet and the first to arrive making any salad bright. I love to saute the cherry tomatoes with a bit of garlic. They always garnish a great grilled steak with the sweet flavor from just a few minutes of heat. I will keep you updated as the tomatoes mature. I made these wonderful little hand pies last week and they are a big hit from the Tequila book. One note is that the filling will make many more pies than 20 so I did use two boxes of puff pastry and froze half of them on cookie sheets to use later. Note: do not try and make them smaller. The filling pushes out and they do not work trying to make them smaller than a 3 1/2 inch round. Monday I flew to Los Angeles to visit a couple of friends and share an amazing dinner. We had the opportunity to have dinner at Jose Andres’ newest venture. The restaurant “The Bazaar” opened last Nov. in “Hotel SLS”, on 465 S. Le Cienega Blvd. Design by Phillippe Starck is impossible to describe. I can only say if you go to L.A. and do not make time for a visit to The Bazaar you have missed the treat of your life. Small plates rule here and no one does them better than Jose and his team. After making our way through this amazing space of wonderful glitz and drama we were seated in the Rojo y Blanca area. The rest of the evening was a seemless display of perfect food. Each dish was presented as a feast for the eye and then the taste buds. We ordered the tasting menu consisting of 10 to 12 different dishes. When the foie gras arrived on a stick rolled in corn nuts and encased in a blanket of cotton candy we knew the adventure had begun. Thank you Jose for dividing our lives between fantasy and reality. Today is a perfect spring day in Seattle. We lost a lot of plants this year with the cold and so my herb garden is slow on coming back. I hate to buy herbs at the market when I know with a few nice days I will have my old standbys back. We all lost the amazing rosemary plants so I have to start over with new 6 in pots. There are so many articles about planting Stevia and using it instead of sugar. I found some 3 in pots at Wells Medina Nursery and have planted them with the other masses of herbs. Stevia leaves are up to 300 times sweeter than sugar and have no calories. I think they would be great added to ice tea. The information says they will grow up to 36″ tall so I will report as they mature.